Looking for some retro gaming fun from your childhood on Windows Phone? Looking to support a great charity (Great Ormond Street Hospital)? Well go and buy Jetpac right now, lovingly emulated for WP8 by LiveWire Design. Everything is here, the ability to hover, the colour clashing enemies, the blippy sound effects, even the 256x192 pixel sized loading screen. This is Jetpac. 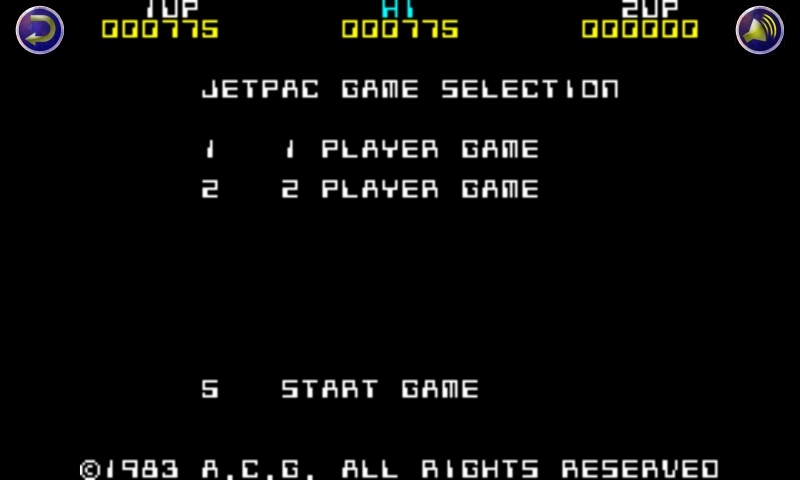 Not a clone, not a re-imagining, this is the 'Ultimate: Play The Game' Jetpac. If I had one complaint, it would be that the accelerometer based controls need to have a calibration option. The movement of the phone replicates the ZX Spectrum joystick, but the neutral position is with the phone flat on the table. I would expect the neutral point to be where I hold the phone comfortably at an angle so I can see the string. A recalibration option would solve this. And if you want to complain about the difficulty level, then you're not going to get any sympathy from me. I played the original. A lot. It was hard, and probably at the upper end of the difficulty curve of the gaming on offer in 1983. But it was playable and you learned how to improve. If the average gamer has gone soft in the last thirty years, tough. (Thirty years since I first played this? Ouch). (PS. Psst! is also available, but nobody except Sinclair User readers ever cared about that one... and nobody really cared about Sinclair User either, YS forvever! ).